Responding to concerns from the public and data collected by S.C. Department of Natural Resources biologists, the South Carolina General Assembly has passed legislation to help rebuild the state’s cobia fishery. The new cobia regulations, which are effective for the 2016 season after receiving Gov. Nikki Haley’s signature, include a catch-and-release period in May and smaller bag and boat limits. The new legislation will affect cobia in South Carolina state waters (out to 3 nautical miles offshore) south of Jeremy Inlet, Edisto Island (032° 31.0´ N latitude; see map for details). Under the new regulations, the possession of cobia in this area will be limited to one person per day and no more than three per boat per day, with a 33-inch fork length size limit. Previously, the bag limit for cobia in this area was two fish per day, with no boat limit. From May 1 to May 31, 2016, this cobia fishery will be limited to catch and release only. It will be unlawful to take and possess cobia from this area during the month of May, and at any time federal regulations provide for the closure of recreational cobia fishing in federal waters. Cobia is a large, fast-growing fish with the streamlined body of a shark and the broad head of a catfish. Along the southern half of the coast, the return of spawning cobia to the area’s rivers each spring has been celebrated for generations, giving anglers the chance to land a hard-fighting game fish from a small boat. In the past decade, as population growth accelerated, South Carolina experienced an approximately 26 percent increase in the number of licensed anglers. As the tradition of spring cobia fishing grew, the angling community began expressing concerns that cobia were no longer as plentiful as they’d once been. South Carolina Department of Natural Resources (DNR) biologists undertook extensive studies of the species to determine whether cobia was being overfished in state waters and, if so, how best to protect and rebuild the population. Researchers “fingerprinted” the DNA from thousands of fish, developed a sophisticated cobia stocking program, and collected information and donated samples from the public in order to construct the most complete picture possible of the status of cobia in South Carolina waters. The science was clear, suggesting that South Carolina’s cobia population is in jeopardy of collapsing due to long-term overharvesting. One of the most noteworthy findings included the discovery that South Carolina’s cobia belong to what’s called a genetically distinct population segment. 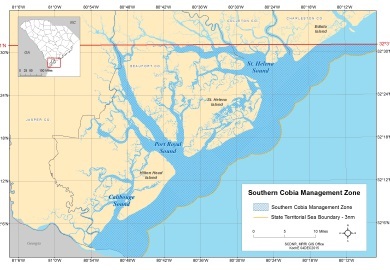 The fish that return each year to Port Royal, St. Helena, and Calibogue Sounds reproduce only in those waterways; they are genetically different from and do not interbreed with the larger, offshore population of South Atlantic cobia. If the South Carolina cobia population disappears, DNR biologists noted, these genetic differences mean that cobia could be absent from the state’s waterways for a very long time. Throughout 2015, DNR biologists hosted public talks along the coast to share the agency’s findings and gather feedback about how members of the public would like to see the cobia problem addressed. More than 1,400 anglers responded to a DNR survey to share their opinions about how cobia should be managed in South Carolina waters. Sixty percent of respondents said they would “support” or “strongly support” the most aggressive approach offered to reduce harvest and rebuild the cobia population. Many individuals and angling organizations reached out to their legislators and wrote editorials to further voice their concerns about the future of South Carolina’s cobia fishery. The Coastal Conservation Association also played an important role in supporting the efforts that resulted in the new law. Based on recommendations made by DNR and the angling community, identical companion bills moved through the Senate and House with support from Sen. Chip Campsen of Charleston, House Agriculture, Natural Resources, and Environmental Affairs Committee Chairman Rep. David Hiott of Pickens, Rep. Bill Hixon of North Augusta, and the Beaufort County legislative delegation. The legislation was signed into law on April 29, 2016, by Governor Nikki Haley and took effect immediately.